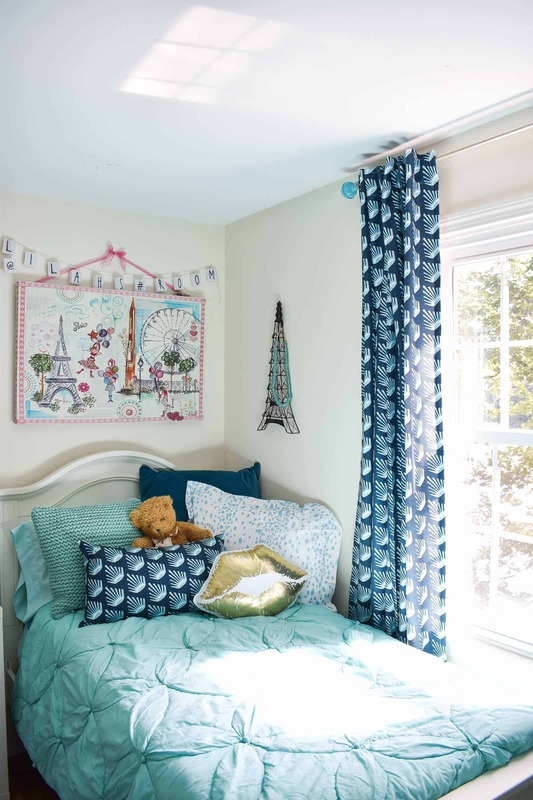 I don’t do a lot of client design work, but when your daughter’s best friend needs a bedroom redesign…. you do it! 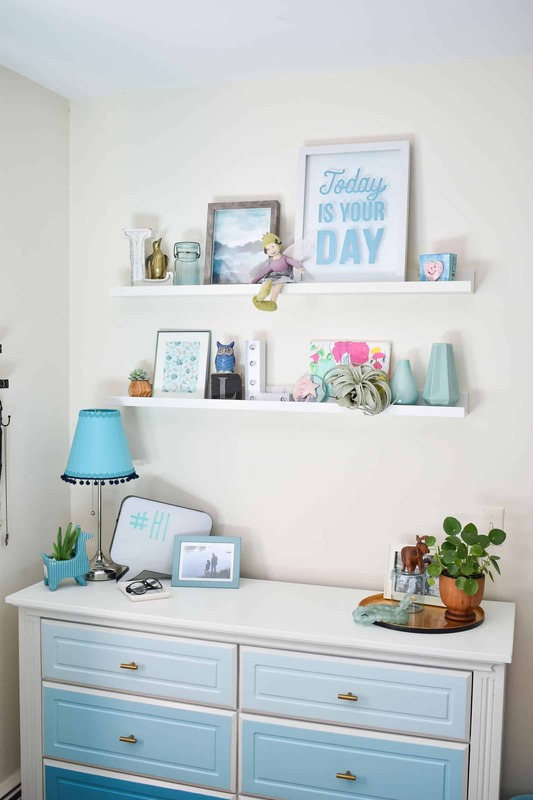 My friend asked me to come over and help organize/ redesign her daughter’s bedroom using shades of blue and teal and as much of her old stuff as possible, but also bringing in new things that might help with the storage, etc. Here’s the glorious before so you get a sense of the landscape. 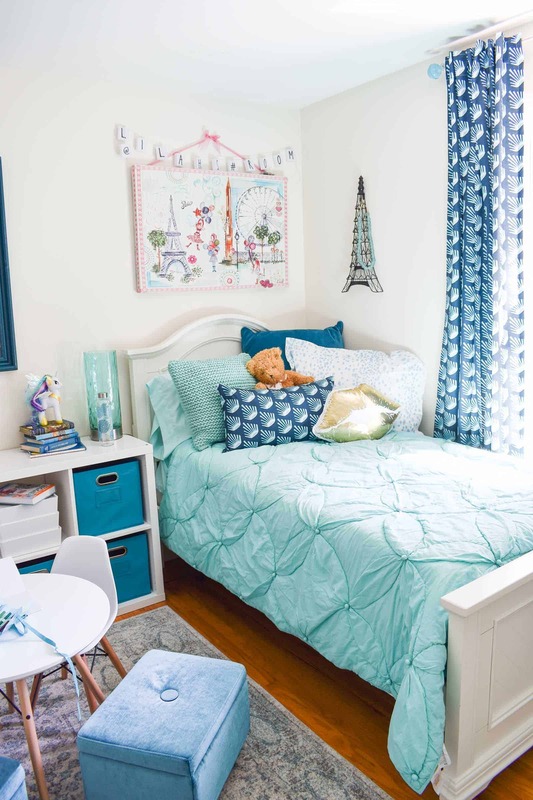 Here’s what we wanted to save: the bed, the storage cubes, and a pair of fun teal storage ottomans. Here’s what I wanted to bring in: a dresser (clothes were being stored everywhere), a place for her to sit and work, and a place to display all her beloved tchotckes. When I’m designing a space, fabric is one of the first places I start. My friend’s daughter doesn’t love florals or anything too ‘froofy’, so I landed on this amazing graphic pattern by Spoonflower. Best part? My friends at the amazing Roostery now make CUSTOM CURTAIN PANELS so in addition to that cute lumbar pillow above, they also made a pair of the most perfect curtains complete with tabs. 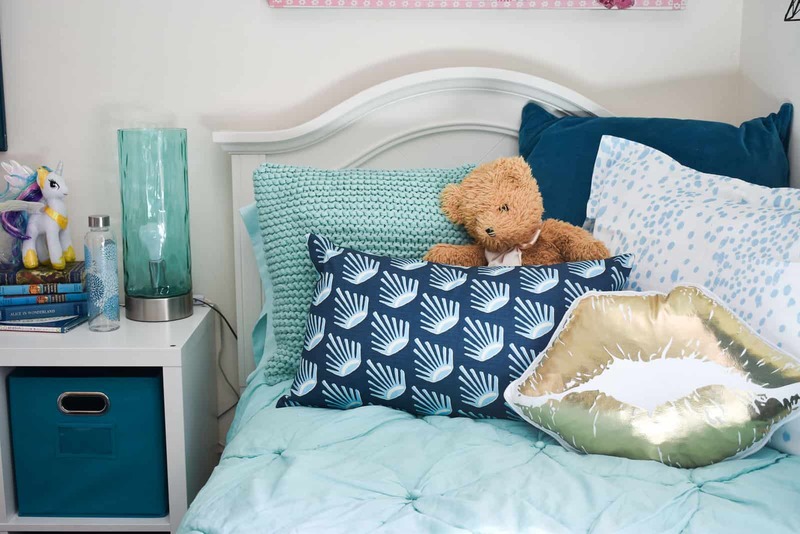 That splatter designed aqua pillow sham also came from them… basically you find a fabric that works for you, and Roostery can make it into whateverrrrr you want! We rearranged the room a bit, just to give her a larger open area for a work space. Those white storage cubes work great for storage AND as a nightstand. 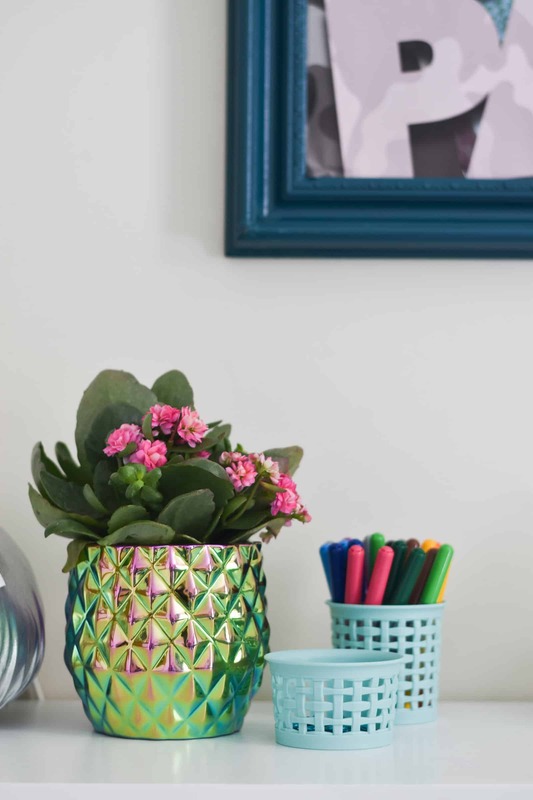 I ordered these simple storage bins in teal to tie in with our color scheme, and my friend picked up that new glass lamp from Homegoods. 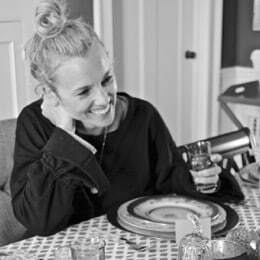 I’m OBSESSED with that table and chairs. They’re sturdy enough for an older child, even though they’re technically meant for someone younger. She had those velvet teal ottomans, but I added casters to the bottom of each one to give them a bit more height and make it easier to move them around for extra seating. Displaying all her treasures, both artwork and souvenirs, was a priority. I ordered a magnetic dry erase board and a cork board so hopefully less papers will end up taped to the walls. An Ikea pendant light hangs from the corner to provide some more light and a bit of glamour to the room. Let’s talk about that poster up there, shall we? Jake Paul is her mostest favoritest human ever. (True story: in the three weeks since I redesigned her room, she’s acquired two more posters of him…) We had to keep the poster, so I repainted that old Restore frame to fit the colors in the room and hung him up front and center. It makes me laugh, AND the little girl LOVES having him. That’s the point of design… make your clients happy! Moving over to the bed, my friend had that quilt already, so I brought in a few throw pillows and then those two pillows from the Roostery. The Paris canvas above the headboard belonged to my daughter’s friend already, but I added a cute strand of LED lights. Next stop, that dresser! I posted about that a couple of weeks ago, but it was $50 at the Restore and makes SUCH a difference. 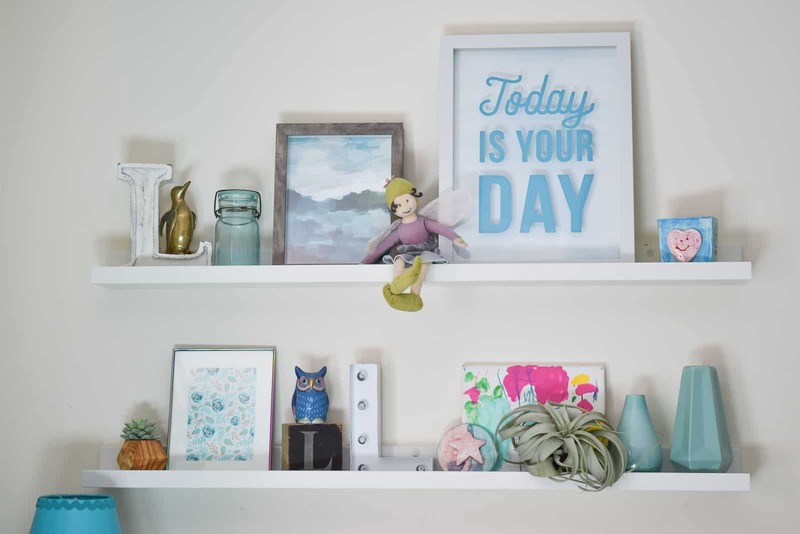 Not only does it provide enough storage for her clothing, but it also brings in some color to that wall and gives her a surface on which she can display a few treasures. The floating shelves above the dresser are from Ikea and they’re actually picture ledges for artwork. They’re the perfect little gallery space for all those little figures and treasures that little girls are so good at collecting. After some simple rearranging, a mega dose of decluttering, and bringing in a more cohesive color palette, this little girl’s room is ready for a play date!! I love that it’s still bright and colorful, but it can grow with her for a few years too. She’s having her friends sign the white board, and has done a pretty good job keeping her new improved room clean and tidy! I love when I can use lots of the home owner’s existing decor/ possessions… It makes the new space feel new and improved but still… theirs. 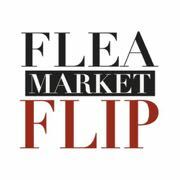 Want to take a gander at the before and after photos again? Thanks so much! I’m so happy with it and my daughter’s friend is overjoyed! So cute! 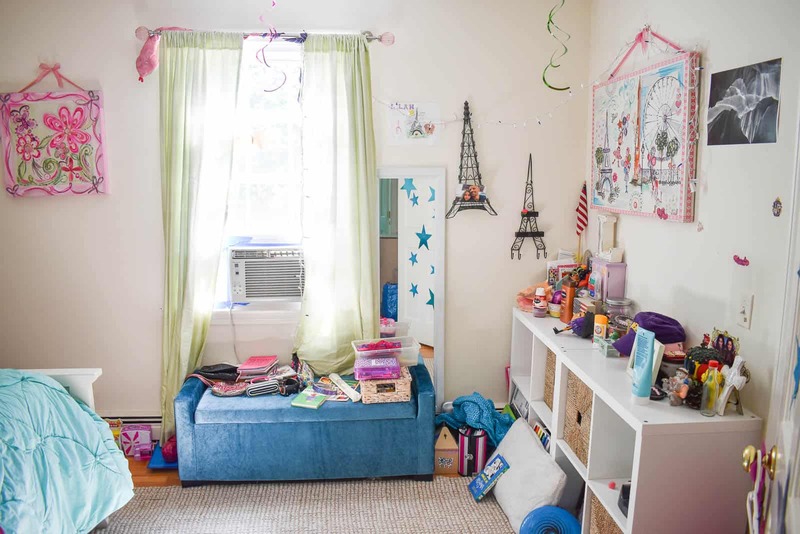 What a fabulous girl’s room at any age. 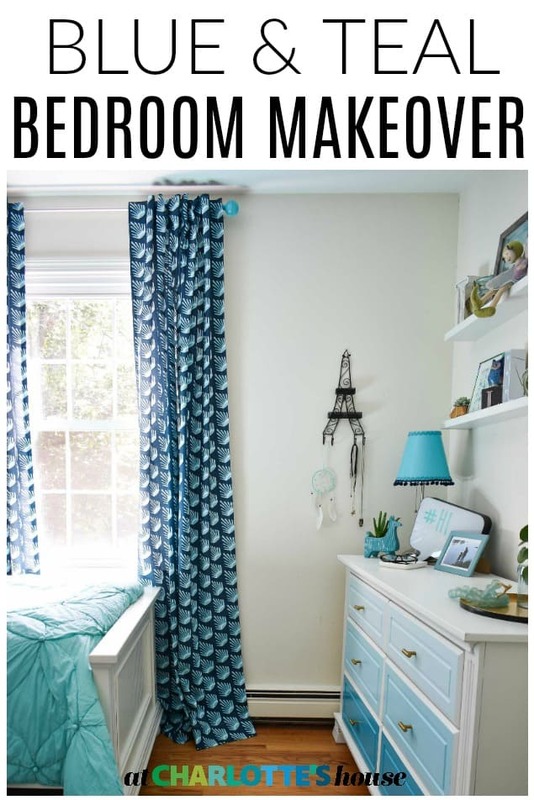 NoW you must creat a boys’s room, just as fabulous. Lol! Haha! 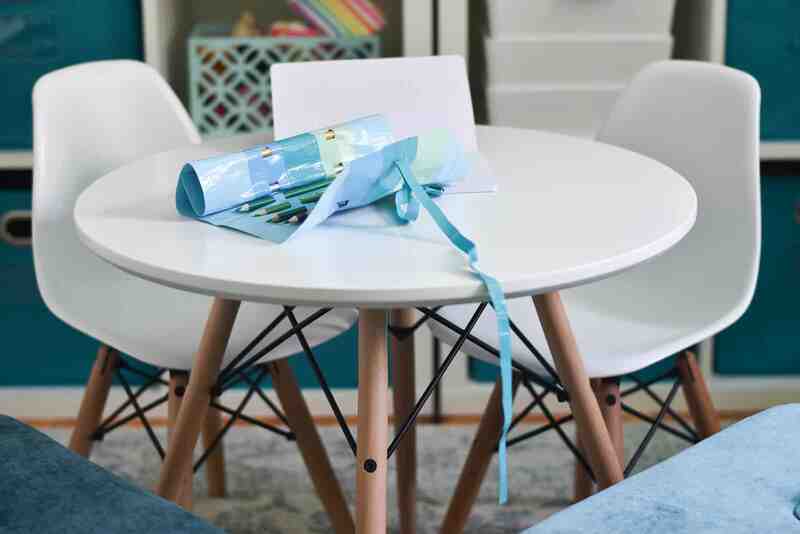 You know… the last two bedrooms I’ve done for Bloggers Heart Habitat have been boys’ rooms… so fun!! Lovely job! Grea mix of ol and new!